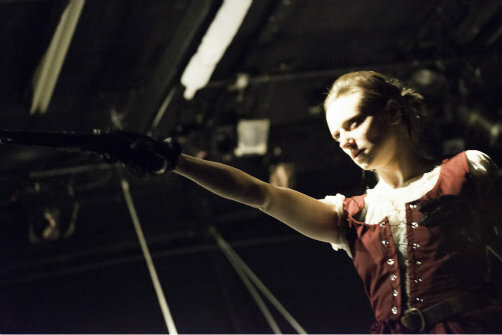 BOTTOM LINE: Everyday Inferno Theatre Company brings a Scandinavian legend to life. It's nice to see a pirate story in which all the pirates are women. Some little girls dream of being both princesses and pirates. Heart of Oak proves that it's possible to be both. Everday Inferno Theatre Company creates adventurous theatrical productions based on new and classic texts. A note in the program from artistic director Anaïs Koivisto explains that the show is based on a Scandinavian legend about a ship of female pirates. It is the story of Princess Alvida (Leslie Gauthier), who turns pirate to flee an arranged marriage. Her crew is made up of laundry women, seamstresses, cooks, and lady's maids. The show is actually narrated by the one male character, the charming Prince Alfred (Jacob Owen), who falls in love with Alvida after her daring escape. But he's not the only one with feelings for her. Though first-mate Johanna (Mariah Freda) doesn't declare her love, her feelings are clear to everyone around her. It's to playwright Laura Hirschberg's credit that they both seem like viable options. Alfred provides a lot of the laughs, but he's not a buffoon. He's actually quite likeable and perhaps the most fully developed character. The other comic relief is Sybill (Sam Bruce), the sassiest and most entertaining of the group. Even at only 60 minutes, the show drags sometimes, and the main issue is that too much time is spent telling us what happened in the past or what is going to happen. For a pirate story, most of the action takes place offstage. Swashbuckling adventures are hard to depict on a limited budget, but there are ways to work around that. And Heart of Oak does this at some points, using shadows and even intricate sword play, thanks to Jon Meyer's fight choreography. The show also picks up whenever there is a sea shanty, and there are plenty of those. Aside from some brief innuendo, it's a pretty family-friendly show—one that could even be geared more towards children, if they wanted to go in that direction.